Here we take a look at a truely wireless headphone arrangement, the SoundPEATS Q16. These are Dual Wireless Earbuds with separate batteries, Bluetooth 4.2 and a dash of Sweatproofing for the Sporty types out there. The In-Ear Headset also features a Microphone and a Secure Fit to keep them in place during whilst active. 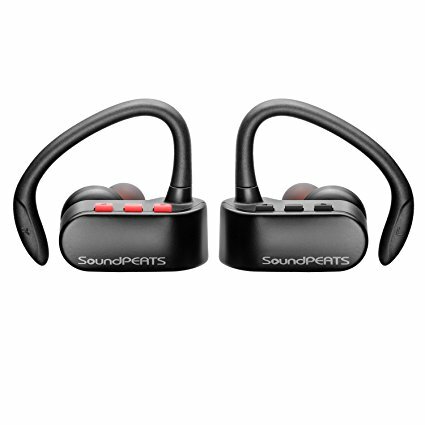 SoundPEATS Audio is a relatively new company (2010) that has a wide range of music listening products for in-ear, on-ear, sport and business use. Their latest product is the Q16 True Wireless Bluetooth 4.2 Earphone. It’s a pretty nice and compact piece of gear because it’s simply two parts (one for each ear). It really is “true wireless” because there’s no connecting wire between your earphones or the streaming device. The ideal application for the Q16 Bluetooth Earphone is sport or daily workouts. It really works well for anyone who is constantly on the go and doesn’t want the annoyance of wires. They’re quite simple to put on (just slips over and in the ear) and connecting them to your Bluetooth device is easy. Once you get them adjusted in the ears and connected the noise isolation is great but without blocking all your ambient noise. This leaves you to enjoy your music or talk on the phone while still remaining aware of your surroundings. It’s all hands-free. The Q16 True Wireless Bluetooth 4.2 Earphone by SoundPEATS charges easily with a split USB cable (included) and has a battery life of about 6 hours.